Promotional specials are the key to long-term sustainability to your business. Experienced and successful salon and spa owners know simple but effective specials keep traffic flowing, increase revenue and create buzz. Constant communication keeps you on your customers’ minds and improves your chances of returning visits and referrals. Whether your goal is to acquire new clients or improve customer retention, DesignBetty has just the right ideas, products, and online tools to help you manage your salon marketing campaigns and increase your profit margin. 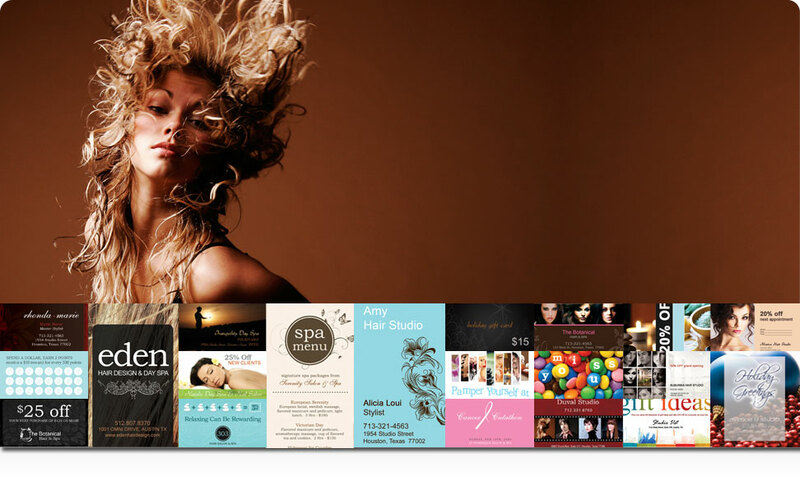 Using our online design studio, you can create professional-looking salon flyers, branded salon coupon cards, well-written spa brochures menu and price lists, targeted promotion postcards, and elegant salon gift certificates to convey your promotional message to your audience. It is important to stand out from your competitors with respectable, high-quality collateral. Before giving you their business, customers will judge your products and services based on what they see. Your business can't afford to wait for walk-ins or for word-of-mouth to attract more business while your competitors aggressively scoop them up. Growing your business quickly requires effective and professional marketing and communication. Marketing collateral such as coupons cards, promotional flyers, marketing postcards are great ways to promote your next sale or to keep in touch with your clients. Announce new products, services and events. Direct consumers to your website or enhance your brand strategy by tying your direct marketing to print media campaigns. Start a promotion campaign today. Browse through our design selection for ideas and pick one that matches your personality. Customize it to become your very own unique marketing collateral. Promoting your business with hard-to-resist specials is the key to driving customers through the door and retaining them. Experienced and successful salon and spa owners know that simple-but-effective salon marketing & specials keep traffic flowing, increase revenue and create community buzz. Not knowing where to start, how to manage the costs and resources are just a few reasons salon and spa owners avoid running promotions. Take some tips from the experts and remove the fear of offering discounts. Dedicate your energy to your best customers. 20% of your customers will end up providing 80% of your business with effective retention. Reward your regulars with specials, and they’ll keep coming back for more. Run specials with during the holiday season. Special events, holiday parties, and family reunions are just some of the reasons consumers need salon and spa services. Promotions during this crucial fourth quarter period drive the herd of heavy spenders your way. Incorporate promotional ideas into your existing marketing strategy. If you’re already spending time and money on advertising, sales and referrals, and public relations, promotions will increase your return-on-investment. Don’t spend a lot of money. You don’t need thousands of dollars to prepare a promotion. Find a simple design concept or idea and make salon flyer and/or business card-size coupons, and make them available around your community. Put yourself completely behind your business. Marketing requires a strong commitment and patience to work. Having confidence in your business will fuel the fire you need to make the investment. Hire a professional firm to make sure that your money and time isn’t wasted. Make marketing your top priority. So, you’ve built your salon, you’ve hired and trained your staff. Time to make marketing your most important to-do because nothing else matters if you don’t have clients walking through your door. Roll-up your sleeves. If you’re just starting, prepare for some hard work ahead. You can lessen the burden by hiring someone specialized in marketing and promotions to guide the process. Identify your target. Are your customers big spenders? Little spenders? Old? Young? Local? Regional? Develop a message that works. Once you know who your ideal customer is, you along with the help of a professional marketing communicator can develop a message and brand that attracts these clients. Create collateral. Get the basics created: business cards, brochures, postcards, and a website are necessary to compete in today’s saturated market. Continue your communication and refine your message. Sometimes your first attempt isn’t as successful as you would have liked. Keep trying and try different message to see if you receive more leads. Some extra hours of work and organization will pay off if you invest time and money into a marketing program to properly launch your business. It’s essential to your success if you want to stand out. Planning or looking for a promotion idea for your business? DesignBetty has thousands of lowcost effective promotion and marketing ideas to bring your business new customers & make them come back for more. Our affordable ideas are highly effective for any new business or established company looking to find new clients. DesignBetty specializes in design and printing business cards, marketing postcards, promotion flyer, coupon cards, gift certificates, brochures, price lists, menus, discount cards, referral cards, and business holiday greeting cards. Customize our design templates for salon, day spa, hair stylist, nail salon, tanning salon, realtors, wedding planner, photographer, restaurant, personal trainer, doctor, dentist, model, law firm, independent sales rep, architect, musician, you name it. We have it all. Start your marketing campaign now, visit our design collection for ideas, and find the perfect match. Personalize your very own marketing collateral. Find us on facebook and twitter to receive marketing & promotion ideas, case studies, expert guides, articles, and more. We love working with small business owners. Learn more about effective promotions, creative ideas and offers that bring you new customers. Follow us on twitter and facebook for special promos and savings. Need some ideas? Here are the best from the industry. These promotional campaigns have quickly drummed up business for very little cost. Design Betty can help you execute these ideas with custom coupon cards and flyers for very little cost. Promotion 1: 25% Off Services for New Clients: It's not easy to take customers away from your competitors. Offer them a reason to give your salon a chance. Promotion 2: $20 Same-as-Cash Coupon: Give your customers incentives to spend money for your services. They will be more likely to spend money if they know they already have a cash coupon to start. Promotion 3: 10% Pre-Book Discount: It's not enough to let your customers walk out of your salon with beautiful hair and a big smile. Make sure they return by giving them an incentive to pre-book their appointment. Promotion 4: $10 Off Next Service: Every now and then, you need to make your clients feel special. There’s no better way than passing on some savings to make sure they come back to you. Promotion 5: Free Haircut on the Fifth Visit: Reward your loyal customers. When someone returns to you for the fifth time, it means something: she/he is more than a repeat customer, that person is now a loyal patron. Let your clients know that you reward loyalty with a free hair cut on the fifth booking. Promotion 6: Bring a Friend Promotion: Don't just ask for referrals; reward your client for bringing a new business through the door. Give them both a reason to come together. Encourage customers to spread the word through on their MySpace/Facebook page or by email. Promotion 8: 25% Off on Your Birthday: Give your customers a gift they can appreciate. Your clients will want to treat themselves to your services, and with the discount, you’ll be putting a smile on their face and money in your pocket. That’s the kind of birthday present clients will tell their friends about. Promotion 7: Free $20 gift certificate with the Purchase of a $100 Gift Certificate: Your clients will love this idea. Not only are they buying something for friends or family, they’re getting a gift for themselves. Promotion 9: $10 Off on Product Purchase of $100 or More: Your profit margin on beauty products is high enough that you can still make money when you offer discounts. It's also a great incentive to get your customers try out your salon products, and if they like it, they will return for more. Promotion 10: 10% Off for a Positive Online Review: Many of your first time customers will look up reviews on your salon before they go there. Tell your loyal customers to go on directory sites and leave a positive remark about your business. Promotion 11: Free Haircut with Color Service on First Visit: A haircut is fast and easy so why not give it away with the purchase of a more expensive beauty service. Promotion 12: 20% off an Additional Service: This is a great way to up-sell your clients. If they’re already there, why not give them an excuse to indulge more. If you follow the advice and steal from this list of promotional ideas, you will see a guaranteed increase in clients and revenue. You’ll create a great name for business in your community, and your customers will be happy.